Received June 15, 2018; Revised November 22, 2018; Accepted December 5, 2018. In search of an effective biological control agent against the tomato pathogen Fusarium oxysporum f. sp. lycopersici, rhizospheric soil samples were collected from eight agro-ecological zones of Bangladesh. Among the bacteria isolated from soil, 24 isolates were randomly selected and evaluated for their antagonistic activity against F. oxysporum f. sp. lycopersici. The two promising antagonistic isolates were identified as Brevundimonas olei and Bacillus methylotrophicus based on morphological, biochemical and molecular characteristics. These two isolates were evaluated for their biocontrol activity and growth promotion of two tomato cultivars (cv. Pusa Rubi and Ratan) for two consecutive years. 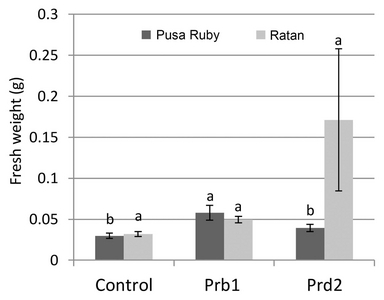 Treatment of Pusa Rubi and Ratan seeds with B. olei prior to inoculation of pathogen caused 44.99% and 41.91% disease inhibition respectively compared to the untreated but pathogen-inoculated control plants. However, treatment of Pusa Rubi and Ratan seeds with B. methylotrophicus caused 24.99% and 39.20% disease inhibition respectively. Furthermore, both the isolates enhanced the growth of tomato plants. The study revealed that these indigenous bacterial isolates can be used as an effective biocontrol agent against Fusarium wilt of tomato. In order to collect indigenous biocontrol agents, plant rhizosphere soil samples were collected from fields of four different crops growing in eight different agro-ecological zones (AEZs) of Bangladesh (Table 1). The soil samples were collected from rhizosphere of rice (Oryza sativa L.), jute (Corchorus capsularis L.), bean (Lablab niger Medikus) and sesban (Sesbania bispinosa (Jacq.) W. Wight, following standard methods (Malleswari and Bagyanarayana, 2013). One gram of each of the collected soil samples was weighed and placed in the test tube containing 9 ml of 0.9% saline (Bahig et al., 2008). Ten folds serial dilution was made and an aliquot was spread onto nutrient agar (NA) plates. The plates were incubated at 28 ± 2°C for 24 h. The individual colonies formed on the NA plates were picked up with sterilized loop and transferred to fresh NA plates for further purification and isolation of single colony. The plates were incubated at 28 ± 2°C for 24 h. The single colonies developed separately at the last tip of the streaks were transferred to NA slants to serve as pure culture. Colonies of all the isolated rhizobacterial isolates formed on NA plates were evaluated for size, pigmentation, form, margin, elevation as described in Bergey’s Manual of Determinative Bacteriology (Bergey and Holt, 2000). Furthermore, tolerances of bacteria to pH, salinity and varying temperatures were evaluated using a turbidometric method (Chookietwattana and Maneewan, 2012). The soil-borne pathogen F. oxysporum used in this study were obtained from the Plant Pathology Division, Bangladesh Agricultural Research Institute, Gazipur, Bangladesh. On the basis of consistent antagonism and stress tolerance activities, two bacterial isolates Prb1 and Prd2 showing promising activity compared to the control were selected for further characterization based on standard biochemical tests (Schaad et al., 2001). The tests conducted were Gram reaction, catalase activity, oxidase activity, nitrate reduction, arginine decarboxylase activity, gelatin liquefaction, urease activity, levan formation from sucrose and utilization of glucose, maltose, lactose, xylose and mannitol. Results of these tests were scored as either positive or negative. Production of extracellular hydrolytic enzymes such as amylase, protease and cellulase were tested by growing each bacterial isolate on the medium containing enzyme substrate; skim milk for protease assay (Naik et al., 2008), carboxymethyl cellulose for cellulase assay (Bhakthavatchalu et al., 2013) and starch for amylase assay (Shruti et al., 2013). Solid agar plates amended with 0.44% of L-glycine was used for qualitative hydrogen cyanide production following the method of Bakker and Schippers (1987). The colour change of the filter paper from yellow to light brown, moderate brown or strong brown was examined for putative HCN production. Siderophore production was detected according to Naik et al. (2008). For assessment of growth on nitrogen free media Norris agar plates was used as described by Kumar et al. (2012). The molecular identification of two isolates was carried out by the 16S rRNA gene sequencing and subsequent analysis using NCBI-BLAST database (Altschul et al., 1990). For genomic DNA isolation, the selected two isolates were grown to log phase. The cells were harvested by centrifugation and genomic DNA was isolated using Maxwell 16 automated DNA extractor (USA) and quantified using NanoDrop spectrophotometer (Thermo Scientific, USA). The 16S rRNA gene of each of the isolates were amplified by PCR using the primers 27F(AGAGTTTGATCMTGGCTCAG) and 1492R (GGTTACCTTGTTACGACTT) according to Sudini et al. (2011). The PCR products were analyzed on 1% agarose gel and desired band was excised and purified. The PCR product was sequenced in both directions at 1st Base Laboratories, Malaysia using an automated DNA sequencer (Genetic Analyzer ABI 3500, Thermo Fisher Scientific Inc., USA). The resulting DNA sequence was compared by NCBI-BLAST database (Altschul et al., 1990). Based on the highest degree of similarity, identity for the bacterial isolates was assigned. For phylogenetic analysis, the 16S rRNA gene sequences were aligned with the Clustal W program and the tree was constructed with the maximum likelihood method based on the Tamura-Nei model (Tamura and Nei, 1993) integrated in the MEGA7 software (Kumar et al., 2016). The phylogenetic tree was tested with 1,000 bootstrap replicates. The two bacterial isolates were grown in nutrient broth medium and stored at constant temperature (28 ± 2°C). The samples taken from the growth medium and diluted to appropriately. The diluted cell suspensions (100 μl) were inoculated onto the solid NA media. The plates were incubated at (28 ± 2°C) temperature for 24 h. The number of colony forming units (cfu) was counted after one day of incubation at each week up to 35 days. In order to determine the threshold level of iron at which siderophore biosynthesis is repressed, the biological agents were inoculated in King’s B medium supplemented with different concentrations of FeCl3 (0, 50, 70 and 100 μM). After inoculation, antagonism was observed following the method of Akköprü and Demir (2005). Root colonization bioassay was carried out following the procedure described by Silva et al. (2003). Surface sterilized tomato seeds were soaked in 25 ml of bacterial suspension (OD600 = 0.1) and then transferred to sterile 0.6% water agar tubes. The seedlings were allowed to grow at room temperature (28 ± 2°C). Visual observations were performed daily in order to detect bacterial growth around arising roots. The two selected bacterial isolates namely, Prb1 and Prd2 were tested for their interaction with other beneficial microorganism B. subtilis, Trichoderma harzianum and T. reesei. Pure culture of B. subtilis, T. harzianum, T. reesei obtained from the Plant Pathology Laboratory, Department of Botany, JU. Each of these three cultures were inoculated at a distance of 2 cm with respective two bacterial isolates and observed for the inhibition zone. The inoculated plates were observed for growth at regular intervals. Experiment was conducted to observe the effect of selected bacterial isolates on disease control and growth promotion of tomato plant in pot culture condition. Two most popular cultivars of tomato (cv. Ratan and Pusa Ruby) in Bangladesh were used in this study (Khalequzzaman et al., 2002; Mistry et al., 2008). For seed surface sterilization and water formulated bacterial inoculation, the method described by Weller and Cook (1983) was followed. For seed treatment, cell suspension containing approximately 1 × 108 cfu/ml was applied to surface sterilized seeds. Seedling vigor test in the laboratory was performed using the standard roll towel method (ISTA, 1999). After 10 days of incubation, observation pertaining to (a) germination (b) dead seed (c) seedling weight (d) root length (e) shoot length and (f) vigor index were recorded. Data were analyzed for significant mean differences using two-way analysis of variance (ANOVA). Means were separated using Duncan’s multiple range test (DMRT; P = 0.05) using SPSS software. In this work, a total of 24 bacteria were isolated from different plant rhizosphere soils from eight agro-ecological zones (AEZ) of Bangladesh (Table 1). The isolates varied in size, shape, elevation and pigment production capacity. These isolates were evaluated for their antagonistic and stress tolerance capacity. In PDA medium growth inhibition was found to range from 0.00 to 87.66% after 10 days of incubation (Table 2). The bacterial isolate Prb1 exhibited maximum growth inhibition (87.66%) against F. oxysporum. Two potential bacterial isolates Prb1 (87.66%) and Prd2 (72.85%) showing consistent antagonistic (Fig. 1) and promising stress tolerance activities (data not shown) were selected for further characterization. Several biochemical tests have been conducted to identify the biocontrol agents. The results of the biochemical tests have been summarized in Table 3. The PCR amplification of the 16S rRNA gene resulted in products approximately 1.5 kb in size. The obtained 16S rRNA gene sequences were deposited in GenBank under the accession number MH458892 and MH458893 for the isolate Prd2 and Prb1, respectively. The BLAST searches revealed that the rRNA gene of the bacterial isolate Prd2 has 100% identity to that of Brevundimonas olei strains and Prb1 showed 100% identity to that of Bacillus methylotrophicus strains. The phylogenetic relation of the isolates is presented in Fig. 2. The results of molecular analyses were consistent with the morphological, biochemical and physiological traits of the isolates. The study showed the decrease in cfu of the isolate B. olei Prd2 after 28 days, while decrease in cfu was observed after 21 days in B. methylotrophicus Prb1isolate (Table 4). It can be concluded that biocontrol agent Prd2 selected in this study can be preserved efficiently at least for 28 days at 28°C. In the in vitro study aiming at whether this antagonistic effect was caused by the siderophore mechanism or not, the selected two bacterial isolates grown in iron-deprived and iron added medium at different ferric ion concentrations (Table 5). Siderophore mediated inhibition of fungal growth ranged from of 56.95 to 59.75% in the absence of FeCl3 whereas the inhibition percentage ranged from 2.57 to 71.62% in presence of FeCl3. At 100 μM FeCl3, the two isolates induced the maximum inhibition. Results showed that none of the bacterial isolates (B. methylotrophicus Prb1 and B. olei Prd2) inhibited B. subtilis, T. harzianum and T. reesei in any of the plates; all the two bacterial isolates were compatible (data not shown). Germination of tomato seeds recorded in germination test varied among the cultivars (Table 6). Bacterization of tomato seeds (cv. Ratan), there was no significative difference observed between treatments. Whereas, tomato seeds (cv. 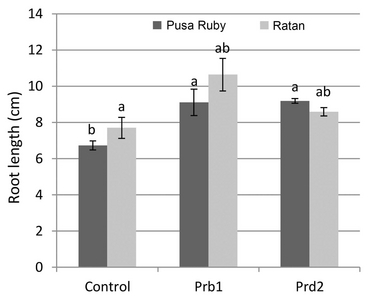 Pusa Ruby), bacterized seeds showed significant difference over the control and the two isolates have the same effect. There was an improvement in seedling vigor upon addition of bacterial isolates to tomato seeds. Under laboratory conditions, all the isolates showed higher mean root length, higher mean shoot length, and vigor index with respect to control (Fig. 3–6). 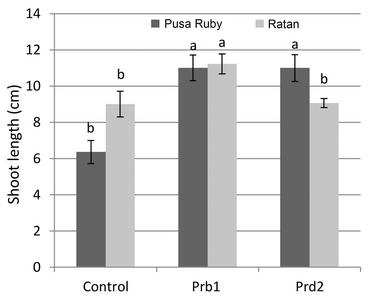 The isolate B. methylotrophicus Prb1 caused the maximum increase (11.22 cm) of shoot length in the Ratan cultivar, while in Pusa Ruby the two isolates have the same effect in shoot length (11 cm). Addition of the isolate B. olei Prd2 recorded the maximum increase of root length (9.18 cm) in Pusa Ruby, while addition of the isolate Prb1 recorded the maximum increase of root length (10.64 cm) in Ratan cultivar. Among the isolates, the isolate B. methylotrophicus Prb1 recorded the highest fresh weight in Pusa Ruby, while addition of the isolate B. olei Prd2 recorded the highest fresh weight in Ratan cultivar. Highest vigor index was observed in both the cultivars by the addition of the isolate Prb1. In this study, disease incidence was reduced to different levels depending on the bacterial isolates. Tomato plants treated with the bacterial isolates looked healthy and showed a lower incidence of wilt disease in both of the growing seasons (Table 7). Treatment of tomato cultivar Pusa ruby with the isolate B. olei Prd2 reduced the disease incidence by 50% in 2015–16 and 39.99% in 2016–17 cropping seasons. Whereas treatment of tomato cultivar Ratan with the same isolate (Prd2) reduced the disease incidence by 40.97% in 2015–16 and 42.85% in 2016–17 cropping seasons. Using B. methylotrophicus Prb1and B. olei Prd2 isolates, growth promotion assays were performed in two successive years. The magnitude of growth promotion varied among the bacterial isolates and tomato cultivars. Results of this experiment showed (Table 8, 9) that bacterial isolates have stimulated plant growth under pot conditions. Highest biomass increase was recorded in treatment with B. methylotrophicus Prb1isolate. The effect of bacterial inoculation showed that inoculation of bacterial isolates slightly increased chlorophyll and carotenoid contents. The agro-ecological system and constituents of plant root exudates determine the type and density of microbial population in a given crop production system (Van Overbeek et al., 1997). Beneduzi et al. (2008) also stated that rhizospheric microbial community is determined by both soil characteristics and plant species. So, the present study was conducted to explore the potentiality of bacteria isolated from the rhizosphere soil of different agro-ecological zones (AEZs) of Bangladesh for biocontrol of Fusarium wilt of tomato as well as plant growth promotion. Out of 24 randomly selected isolates, 22 (91.66%) showed different level of inhibitory activity against F. oxysporum. In dual cultures all bacterial isolates showed variations in inhibition of mycelial growth of F. oxysporum. Several workers also reported similar effects against numerous fungi including Fusarium species (Khan and Zaidi, 2002; Sivamani and Gnanamanickam, 1988). In the present study, variable antifungal activity of different isolates could be attributed to the quantity and effectiveness of the antimicrobials produced by the isolates. The selected two biocontrol isolates were identified by morphological, cultural, biochemical and molecular characteristics. The isolates Prb1 and Prd2 were identified as B. methylotrophicus and B. olei, respectively. Although the presence of B. olei has been reported from various region of the world (Fan et al., 2016; Lee et al., 2010), no literature on the presence of B. olei in Bangladesh soil exists. Hence, this is the first report of B. olei from Bangladesh. In present study it was found that the selected bacterial isolates showed antagonist activity against F. oxysporum along with one or more lytic enzyme production. The addition of FeCl3 to Kings B at 50 and 70 μM eliminated the inhibitory effect of siderophores produced by bacterial isolates against F. oxysporum. This indicated siderophore mediation along with antifungal metabolites. Reduction of antagonism by the addition of iron indicated that siderophores and other defensive metabolites were inhibitory to fungal growth and showed a cumulative effect of different defensive mechanisms (Bultrey and Gheysen, 2000). Suryakala et al. (2004) reported that siderophores exerted maximum impact on F. oxysporum than on Alternaria sp. and Colletotrichum capsici. The selected two rhizobacterial isolates were tested for their cyanogenic activity and the result revealed that only B. olei Prd2 isolate produced HCN. Hydrogen cyanide production by rhizospheric bacteria is beneficial from the biocontrol point of view. This volatile metabolite is thought to play a major role in biological control of some soil borne diseases (Siddiqui et al., 2006). Among the isolates, only isolate B. olei Prd2 was able to grow in the Norris N-free agar medium indicating that this isolate is probably able to utilize the atmospheric nitrogen. Kumar and Gera (2014) reported that Brevundimonas sp. isolated from sugarcane rhizospheric soil showed nitrogenfixing potential. Gulati et al. (2011) also reported nitrogenase activity by acetylene reduction assay of the strains of B. bullata. Both the isolates (Prb1 and Prd2) showed positive for root colonization. Results of the study showed that none of these two isolates inhibited B. subtilis, T. harzianum and T. reesei. Study of these interactions is extremely important as an effective means for their integration with the disease management practices (Belkar and Gade, 2012) and correlating their specific role in the host-pathogen other microorganisms interactions (Mishra et al., 2011). In the present study, Brevundimonas olei and Bacillus methylotrophicus were able to significantly enhance all measured plant growth parameters. There was variation in germination and seed vigor index in both the cultivars with the bacterial treatments when compared to controls indicating that microbial inoculants can enhance seed vigor index. Similar effects of the rhizobacteria were also reported by other authors in tomato (Murthy et al., 2014) and pearl millet (Niranjan et al., 2003). Disease incidence was reduced to different levels depending on the bacterial isolates and was estimated up to 57.14 compared to control on the tomato plants. The use of bioagents was reported quite effective to control Fusarium wilt disease in tomato (Freeman et al., 2002). In the present study, B. methylotrophicus Prb1 showed highest in vitro antagonistic activity but in the pot culture isolate B. olei Prd2 showed slightly higher disease inhibition than Prb1. This may be due to increased fitness of the isolate B. olei Prd2 to the biotic and abiotic factors of the experimental field. Wei et al. (2017) stated that microbe–microbe interactions are very sensitive to several abiotic and biotic factors such as environmental temperature, productivity and microbial community composition, which could affect biocontrol outcomes by changing the strength of species interactions. In the experiment, application of B. olei reduced 44.99 and 41.91% of disease incidence of two tomato cultivar Pusa Rubi and Ratan, respectively as compared to infected untreated control. Application of B. methylotrophicus also reduced percentage of disease incidence of tomato plants as compared to infected untreated control. Thus, these treatments improved plant health through reducing wilt symptoms. Our results also corroborated with the findings of other researchers (Almoneafy et al., 2012; Ge et al., 2016). The growth responses of test plant tomato to rhizobacterial treatments varied significantly with the cultivar-type and isolate type. The variations in plant growth promotion among the isolates are attributed to their individual competencies (Geetha et al., 2014). The selected isolates significantly increased root length, shoot length and exhibited biomass increase of treated tomato plants compared to control plant. Present results were in agreement with those reported by Mezeal (2014), who reported that the growth parameters of tomato plants were increased with the addition of B. subtilis and P. fluorescens to the soil with F. oxysporum under field condition. Extensive rooting was observed in bacteria-treated tomato plants compared with the control. The rooting might have contributed towards the resistance, growth and development of the plant. According to Raj et al. (2003), the possible mechanisms could be the larger and healthier root system leading to improved uptake of water and nutrients. In respect of B. methylotrophicus our results corroborated with the findings of Ambawade and Pathade (2015) and Ge et al. (2016). In respect of Brevundimonas species, similar improvement of growth parameters has been reported in wheat (Rana et al., 2011) and Bt-cotton (Kumar and Gera, 2014). Changes in plant pigments of two cultivars of tomato during tomato growth season 2015–16 and 2016–17 was also observed. The results shown that bacterial treatments increased chlorophyll and carotenoid contents in tomato plants compared to the untreated control. Similar pattern of influence was also reported in other studies (Lamsal et al., 2013). Application of rhizobacterial isolates might have affected the production of these biochemicals in plants. These plants mediated mechanism had been proposed by researchers as regulating force behind plant growth promotion by PGP bacterial strains (Silva et al., 2003). In conclusion, among the 24 rhizobacterial isolates tested, we have found two potential indigenous soil-borne antagonists, Brevundimonas olei Prd2 and Bacillus methylotrophicus Prb1. The selected rhizobacterial isolates are capable of reducing Fusarium wilt disease under local agroclimatic conditions of Bangladesh. This study reports new native isolates of B. olei with potential to control not only Fusarium wilt disease but also promoted growth of tomato plant. Therefore, these bacteria could be used at the field level to control the F. oxysporum. However, further studies on different formulations for practically implementing such propositions will be required. Fig. 1. Inhibition of F. oxysporum f. sp. lycopersici by two bacterial isolates (A) Bacillus methylotrophicus Prb1, and (B) Brevundimonas olei Prd2, and (C) mycelial growth of F. oxysporum in control plate. Fig. 2. Phylogenetic tree showing position of the biocontrol agents (▲) used in this study. The 16S rDNA sequences were aligned with the ClustalW and the tree was constructed with the maximum likelihood method based on the Tamura-Nei model integrated in the MEGA7 software. The GenBank accession numbers of the DNA sequences are shown in parentheses. Fig. 3. The effect of bacterization of tomato seeds with two biocontrol agents on shoot length of tomato seedlings. Data are mean of three replications. Bars indicate standard error of the mean. Fig. 4. The effect of bacterization of tomato seeds with two biocontrol agents on root length of tomato seedlings. Data are mean of three replications. Bars indicate error of the mean. Fig. 5. The effect of bacterization of tomato seeds with two biocontrol agents on the fresh weight of tomato seedlings. Data are mean of three replications. Bars indicate standard error of the mean. Fig. 6. The effect of bacterization of tomato seeds with two biocontrol agents on vigor index of tomato seedlings. Data are mean of three replications. Bars indicate standard error of the mean. Values are the means of three replications. Means in a column with similar letter(s) are not significantly different at 0.05 level. All the tests were conducted in three replicates, ‘+’ indicates positive reaction, ‘−’ indicates negative reaction. Values are the mean of three replications. Means in a column with similar letter(s) are not significantly different at 0.05 level. Values are the means (± SEM) of three replications. Means in a column with similar letter(s) are not significantly different at 0.05 level according to Duncan Multiple Range Test. Values are the means (± SE) of three replications. Means in a column with similar letter(s) are not significantly different at 0.05 level according to Duncan Multiple Range Test. Values are the means (± SEM) of three replications. Means in a column with similar letter(s) are not significantly different at 0.05 level. Akköprü A, and Demir S. 2005. Biological control of Fusarium wilt in tomato caused by Fusarium oxysporum f.sp. lycopersici by AMF Glomus intraradices and some rhizobacteria. J Phytopathol 153: 544-550. Almoneafy A, Xie GL, Tian WX, Xu LH, Zhang GQ, and Ibrahim M. 2012. Characterization and evaluation of Bacillus isolates for their potential plant growth and biocontrol activities against tomato bacterial wilt. Afr J Biotechnol 11: 7193-7201. Altschul SF, Gish W, Miller W, Myers EW, and Lipman DJ. 1990. Basic local alignment search tool. J Mol Biol 215: 403-410. Ambawade MS, and Pathade GR. 2015. Production of gibberellic acid by Bacillus siamensis BE 76 isolated from banana plant (Musa spp.). Int J Sci Res 4: 394-398. Ayvaz M, Koyuncu M, Güven A, and Fagerstedt KV. 2012. Does boron affect hormone levels of barley cultivars?. Eurasia J Biosci 6: 113-120. Bahig AE, Aly EA, Khaled AA, and Amel KA. 2008. Isolation, characterization and application of bacterial population from agricultural soil at Sohag Province, Egypt. Mal J Microbiol 4: 42-50. Bakker AW, and Schippers B. 1987. Microbial cyanide production in the rhizosphere in relation to potato yield reduction and Pseudomonas spp. mediated plant growth stimulation. Soil Biol Biochem 19: 451-457. Belkar YK, and Gade RM. 2012. Compatibility of fluorescent Pseudomonads with beneficial microorganisms. J Plant Dis Sci 7: 267-268. Beneduzi A, Peres D, Vargas LK, Bodanese-Zanettini MH, and Passaglia LM. 2008. Evaluation of genetic diversity and plant growth promoting activities of nitrogen-fixing Bacilli isolated from rice fields in south Brazil. Appl Soil Ecol 39: 311-320. Bergey DH, and Holt JG. 2000. Bergey’s manual of determinative bacteriology . Lippincott Williams & Wilkins, Philadelphia, USA. 787 pp. Bhakthavatchalu S, Shivakumar S, and Sullia SB. 2013. Characterization of multiple plant growth promotion traits of Pseudomonas aeruginosa FP6, a potential stress tolerant biocontrol agent. Ann Biol Res 4: 214-223. Bultreys A, and Gheysen I. 2000. Production and comparison of peptide siderophores from strains of distantly related pathovars of Pseudomonas syringae and Pseudomonas viridiflava LMG 2352. Appl Environ Microbiol 66: 325-331. Carmassi G, Incrocci L, Incrocci G, and Pardossi A. 2007. Non-destructive estimation of leaf area in (Solanum lycopersicum L.) and gerbera (Gerbera jamesonii H. bolus). Agr Med 137: 172-176. Chookietwattana K, and Maneewan K. 2012. Selection of efficient salt-tolerant bacteria containing ACC deaminase for promotion of tomato growth under salinity stress. Soil Environ 31: 30-36. Fan Z-U, Miao C-P, Qiao X-G, Zheng Y-K, Chen H-H, Chen Y-W, Xu L-H, Zhao L-X, and Guan H-L. 2016. Diversity, distribution, and antagonistic activities of rhizobacteria of Panax notoginseng. J Ginseng Res 40: 97-104. Freeman S, Zveibil A, Vintal H, and Maymon M. 2002. Isolation of non-pathogenic mutants of Fusarium oxysporum f. sp. melonis for biological control of Fusarium wilts in Cucurbits. Phytopathology 92: 164-168. Ge B, Liu B, Nwet TT, Zhao W, Shi L, and Zhang K. 2016. Bacillus methylotrophicus strain NKG-1, isolated from Changbai mountain, China, has potential applications as a biofertilizer or biocontrol agent. PLoS ONE 11: e0166079. Geetha K, Chaitanya K, and Bhadraiah B. 2014. Isolation and characterization of PGPR isolates from rhizosphere soils of greengram in Warangal district of Telangana. Int J Pharm Bio Sci 5: 153-163. Gulati A, Sood S, Rahi P, Thakur R, Chauhan S, and Chawla I. 2011. Diversity analysis of diazotrophic bacteria associated with the roots of tea (Camellia sinensis (L.) O. Kuntze). J Microbiol Biotechnol 21: 545-555. Guo JH, Qi HY, Guo YH, Ge HL, Gong LY, Zhang LX, and Sun PH. 2004. Biocontrol of tomato wilt by growth promoting rhizobacteria. Biol Control 29: 66-72. ., ISTA 1976. International rules for seed testing. Seed Sci Technol 4: 3-49. ., ISTA 1996. International rules for seed testing. Seed Sci Technol 24: 211-288. ., ISTA 1999. International rules for seed testing. Seed Sci Technol 27: 27-31. Khalequzzaman KM, Jinnah MA, Rashid MAAM, Chowdhury MNA, and Alam MM. 2002. Effect of Pseudomonas fluorescens in controlling bacterial wilt of tomato. Pak J Plant Pathol 1: 71-73. Khan MS, and Zaidi A. 2002. Plant growth promoting rhizobacteria from rhizosphere of wheat and chickpea. Ann Plant Prot Sci 10: 265-271. Kumar P, Dubey RC, and Maheshwari DK. 2012. Bacillus strains isolated from rhizosphere showed plant growth promoting and antagonistic activity against phytopathogens. Microbiol Res 167: 493-499. Kumar S, Stecher G, and Tamura K. 2016. MEGA7: Molecular evolutionary genetics analysis version 7.0 for bigger datasets. Mol Biol Evol 33: 1870-1874. Kumar V, and Gera R. 2014. Isolation of a multi-trait plant growth promoting Brevundimonas sp. and its effect on the growth of Bt-cotton. 3. Biotech 4: 97-101. Lamsal K, Kim SW, Kim YS, and Lee YS. 2013. Biocontrol of late blight and plant growth promotion in tomato using rhizobacterial isolates. J Microbiol Biotechnol 23: 897-904. Lee M, Srinivasan S, and Kim MK. 2010. 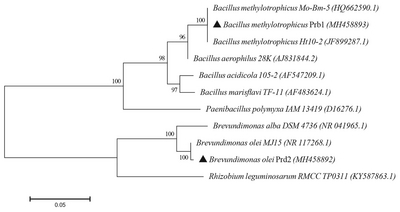 New taxa in Alphaproteobacteria: Brevundimonas olei sp. nov., an esteraseproducing bacterium. J Microbiol 48: 616-622. Maclachlan S, and Zalik S. 1963. Plastid structure, chlorophyll concentration and free amino-acid composition of a chlorophyll mutant of barley. Can J Bot 41: 1053-1062. Malleswari D, and Bagyanarayana G. 2013. In vitro screening of rhizobacteria isolated from the rhizosphere of medicinal and aromatic plants for multiple plant growth promoting activities. J Microbiol Biotechnol Res 3: 84-91. Mezeal IA. 2014. Study biocontrol efficacy of Pseudomonas fluorescens and Bacillus subtilis against Rhizoctonia solani and Fusarium oxysporum causing disease in tomato. Indian J Fund Appl Life Sci 4: 175-183. Mishra DS, Gupta AK, Prajapati CR, and Singh US. 2011. Combination of fungal and bacterial antagonists for management of root and stem rot disease of soybean. Pak J Bot 43: 2569-2574. Mistry KK, Chatterjee DD, and Khair A. 2008. Effect of compost on diseases incidence in winter tomato (Lycopersicon esculentum Mill.) under open field conditions. B Res Pub J 1: 312-318. Murthy KN, Uzma F, Chitrashree , and Srinivas C. 2014. Induction of systemic resistance in tomato against Ralstonia solanacearum by Pseudomonas fluorescens. Am J Plant Sci 5: 1799-1811. Naik PR, Raman G, Narayanan KB, and Sakthivel N. 2008. Assessment of genetic and functional diversity of phosphate solubilizing fluorescent pseudomonads isolated from rhizospheric soil. BMC Microbiol 8: 230. Niranjan Raj S, Deepak SA, Basavaraju P, Shetty HS, Reddy MS, and Kloepper JW. 2003. Comparative performance of formulations of plant growth promoting rhizobacteria in growth promotion and suppression of downy mildew in pearl millet. Crop Prot 22: 579-588. Raihan A, Khandaker M, Ferdous M, Rahman MA, Uddin J, and Nahiyan M. 2016. Trichoderma suppresses pathogenic Fusarium causing tomato wilt in Bangladesh. British Microbiol Res J 14: 1-9. Raj SN, Deepak SA, Basavaraju P, Shetty HS, Reddy MS, and Kloepper JW. 2003. Comparative performance of formulations of plant growth promoting rhizobacteria in growth promotion and suppression of downy mildew in pearl millet. Crop Prot 22: 579-588. Ramanathan A, Shanmugam V, Raguchander T, and Samiyappan R. 2002. Induction of systemic resistance in ragi against blast disease caused by Pseudomonas fluorescens. Ann Plant Prot Sci 10: 313-318. Rana A, Saharan B, Joshi M, Prasanna R, Kumar K, and Nain L. 2011. Identification of multi-trait PGPR isolates and evaluating their potential as inoculants for wheat. Ann Microbiol 61: 893-900. Schaad NW, Jones JB, and Chun W. 2001. Laboratory guide for the identification of plant pathogenic bacteria . APS Press, St. Paul, MN, USA. 373 pp. Shruti K, Arun K, and Yuvneet R. 2013. Potential plant growth-promoting activity of rhizobacteria Pseudomonas sp in Oryza sativa. J Nat Prod Plant Resour 3: 38-50. Siddiqui IA, Shaukat SS, Sheikh IH, and Khan A. 2006. Role of cyanide production by Pseudomonas fluorescens CHA0 in the suppression of root-knot nematode, Meloidogyne javanica in tomato. World J Microbiol Biotechnol 22: 641-650. Silva HSA, Romeiro RS, and Mounteer A. 2003. Development of a root colonization bioassay for rapid screening of rhizobacteria for potential biocontrol agents. J Phytopathol 151: 42-46. Singh AK, and Kamal S. 2012. Chemical control of wilt in tomato (Lycopersicon esculentum L.). Int J Hortic 2: 5-6. Sivamani E, and Gnanamanickam SS. 1988. Biological counts of F. oxysporum f.sp. cubense in banana by inoculation with Pseudomonas fluorescens. Plant Soil 107: 3-9. Song W, Zhou L, Yang C, Cao X, Zhang L, and Liu X. 2004. Tomato Fusarium wilt and its chemical control strategies in a hydroponic system. Crop Prot 23: 120-123. Sudini H, Liles MR, Arias CR, Bowen KL, and Huettel RN. 2011. Exploring soil bacterial communities in different peanut-cropping sequences using multiple molecular approaches. Phytopathology 101: 819-827. Suryakala D, Maheswaridevi PU, and Lakshmi KV. 2004. Chemical characterization and in vitro antibiosis of siderophores of rhizosphere fluorescent pseudomonads. Indian J Microbiol 44: 105-108. Tamura K, and Nei M. 1993. Estimation of the number of nucleotide substitutions in the control region of mitochondrial DNA in humans and chimpanzees. Mol Biol Evol 10: 512-526. Tans-Kersten J, Huang H, and Allen C. 2001. Ralstonia solanacearum needs motility for invasive virulence on tomato. J Bacteriol 183: 3597-3605. Van Overbeek L, Van Veen JA, and Van Elsas JD. 1997. Induced reporter gene activity, enhanced stress resistance, and competitive ability of a genetically modified Pseudomonas fluorescens strain released into a field plot planted with wheat. Appl Environ Microbiol 63: 1965-1973. Wei Z, Huang J, Yang T, Jousset A, Xu Y, Shen Q, and Friman V. 2017. Seasonal variation in the biocontrol efficiency of bacterial wilt is driven by temperature-mediated changes in bacterial competitive interactions. J Appl Ecol 54: 1440-1448. Weller DM, and Cook RJ. 1983. Suppression of take-all of wheat by seed treatments with fluorescent Pseudomonads. Phytopathology 73: 463-469. Whipps JM. 1997. Ecological considerations involved in commercial development of biological control agents for soilborne diseases. In: Modern soil microbiology, eds. by JD. van Elsas, JT. Trevors, and EMH. Wellington , pp. 525-545. Elsevier, The Netherlands.